Founded in 1885, the Indian National Congress was originally a moderate organization, seeking for economic reforms and a greater role for Indians in determining British policy in India. Its original leadership included a number of British who were sympathetic to its aims, and Congress was generally supportive of the British during the First World War. However, by 1920, Congress had come to be dominated by Mohandas Gandhi, an Indian nationalist who sought an end to the British Raj (rule) in India. Gandhi pioneered the use of nonviolent protest and succeeded in transforming the Indian independence movement into a mass movement. However, his rejection of violence and pleas for the equal status of women and lower castes contrasted with his devotion to a form of Hindu religious mysticism that rejected smallpox vaccination and other modern innovations and distanced him from the large Muslim minority. Ghandi's movement succeeded in creating considerable sympathy for Indian independence among the British public. On the outbreak of the war in Europe in 1939, the British Viceroy, Linlithgow, declared war on the Axis without consulting any Indian leaders. Congress leaders responded by resigning en masse from the government. On 8 August 1942, Congress called for the British to "Quit India" and prepared to launch a massive campaign of civil disobedience. However, Congress was thoroughly infiltrated by government agents, who gave ample warning of Congress' plans. Gandhi and other INC leaders were interned and the protests which followed, while widespread and damaging, were successfully suppressed. Thereafter India was, in the words of one British general, "an occupied and hostile country." The Axis, and particularly the Japanese, carefully fanned the flames of Indian nationalism with their propaganda, but few of the leaders of the Indian National Congress were willing to embrace Japan. Instead, the Congress sought immediate independence as the price for supporting the war against Japan. 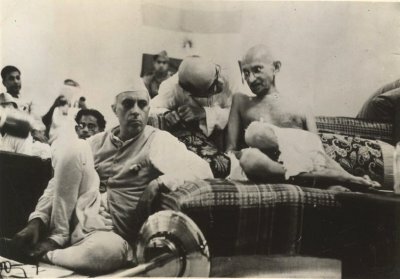 Gandhi himself took the position that the British must leave India immediately, after which the Indians should employ the same methods of nonviolent resistance against the Japanese that had been employed against the British. This frankly ludicrous proposal diminished his standing with foreign sympathizers, particularly in the United States, and even among his own people. Gandhi once stated that he could never have achieved what he achieved against the British if the British had not been so civilized. While his use of the word “civilized” was probably intended to be ironic, the statement is valid at face value, and points to the flaw in his approach to the prospect of Japanese invasion. ... sorts ill with your ruthless aggression against China. You will be sadly disillusioned if you believe you will receive a wiling welcome from India.... We need no aid from foreign powers. (Browne 1967). Gandhi added that he believed it would be tragic if the Axis won the war. However, Gandhi's attitude was not universally shared, and Subhas Chandra Bose organized an Indian National Government to collaborate with the Japanese. This received little support from Indians while the war was going on, but its members enjoyed considerable public sympathy after the war, when many were put on trial by the British for treason. The Muslim leadership in Congress became increasingly disenchanted with the Hindu-dominated movement and eventually formed their own Muslim League. The Muslim League remained pointedly loyal to Britain during the war, in the expectation that Britain would insist on guarantees of minority rights in a self-governing India. As it turned out, India was partitioned instead, with Muslims in control of an independent Pakistan.